It is just a century since the discovery that X-rays could be diffracted through crystalline matter, and the use of that discovery to explore the structure of crystals and the molecular or ionic materials that make them up. The United Nations declared 2014 as the International Year of Crystallography to mark this anniversary, as well as other important events in the history of the science: it is about 400 years since the astronomer Kepler noticed the invariable six-fold symmetry of snowflakes, and 50 years since the biochemist Dorothy Hodgkin won the Nobel Prize for determining the structures of many important biochemical substances using X-ray diffraction. An essential purpose of any International Year is to educate the world about the topic celebrated, and the International Union of Crystallography (IUCr) and the United Nations Educational, Scientific and Cultural Organization (UNESCO) were jointly charged with the organization and conduct of the International Year of Crystallography 2014 (IYCr2014). The IUCr is an International Scientific Union - one of the international bodies responsible for overseeing and developing a particular science at the professional and academic level. The IUCr has always understood how essential it is to educate the coming generation thoroughly, in order to produce the best practitioners for the future. Its involvement with the International Year has allowed it to extend its areas of activity to a still younger generation, that of high-school and even younger children; and also to produce material designed to bring to the general public an appreciation of a science that, while crucial to so many aspects of modern scientific and technological research and development, is not widely known about. At the same time, the worldwide nature of a UN International Year has provided new opportunities to develop educational activities at all levels in parts of the world where crystallography is as yet a poorly developed science, and to set in motion new initiatives in capacity building and international cooperation. In this article we review some of the educational initiatives of IYCr2014, and relate them to the ongoing efforts of the IUCr to provide access to the very best educational resources. In the modern world, it will come as no surprise that much of this effort takes advantage of computers and information technology. The Opening Ceremony at UNESCO, Paris, on 20-21 January 2014, set the theme for the year. In a video address, UN Secretary General Ban Ki-moon recognised the relevance of crystallography to an astonishing range of sciences and applied technologies, and its importance in sustainable development strategies (Fig. 1). Lectures followed to illustrate this importance worldwide - and beyond: the Curiosity Rover has performed powder diffraction analysis of the Martian surface, in a breathtaking demonstration of remote experimentation. A Round Table brought together early-career scientists from across the globe, to analyse the challenges facing crystallography everywhere, but perhaps especially in the less economically advanced countries. The result was a declaration identifying the most pressing challenges and suggesting how best to address them. Training was identified as a crucial need; and the recognition that not every educational establishment can provide the necessary level of training locally emphasised the need for collaboration and distributed activities - in which remote learning and web resources will undoubtedly feature. Fig. 1. The official opening of the International Year for Crystallography highlighted the importance of education in a science that is involved in so many aspects of understanding the solid state of matter. Other formal declarations were to emerge from regional Summit meetings held in Pakistan, Brazil and South Africa (Fig. 2). These were intended to bring together scientists from countries in three widely separated parts of the world, each with a particular crystallographic theme. To encourage scientists to think beyond political borders and other distinctions, the summit meetings, attended by scientists in academia and industry, and by science administrators, were specifically planned between countries divided on the basis of geography, ethnicity, religion and politics. The meetings focused on high-level science, but also served to highlight the difficulties and problems of conducting competitive scientific research in different parts of the developing world. Fig. 2. A group of delegates signing the appeal for regional collaboration in South Asia, including such educational initiatives as joint training workshops and video-based lecturing. A very practical start in addressing the training requirements was provided by the IUCr-UNESCO OpenLab project, a network of operational crystallographic laboratories in selected universities in Africa, Latin America and South-East Asia. These provided high-level educational opportunities to local students and young professors, taking advantage of the the scientific and educational expertise of the IUCr, the diplomatic and educational channels of UNESCO, and the partnership of crystallographic instrumentation manufacturers. Several manufacturers also collaborated in an OpenFactory, an intensive training workshop at their European headquarters where some 20 early-career scientists travelled from many countries to gain hands-on experience of the latest equipment. A number of projects aimed at capturing the enthusiasm of schoolchildren were launched around the challenging but exciting art of crystal growing. Materials for a crystal-growing competition were supplied to selected schools belonging to the UNESCO Associated Schools Network. The IYCr2014 web site (www.iycr2014.org) was used to catalogue a number of existing national or regional crystal-growing competitions, and to provide tutorial materials, educational videos and guidelines to encourage the start of new competitions, to run in this and succeeding years. A separate global competition encouraged all young crystal growers to submit video diaries of their experiences. Finally, a Global Experiment in Crystallisation set up by the Royal Society of Chemistry allowed schoolchildren worldwide to post the results of their experiment on a global website, and so generate a mash-up of the dynamically growing database of collected results and a world map showing the locations of contributors (Fig. 3). Fig. 3. Collecting and displaying the results of a Global Experiment. As well as these centrally-managed initiatives, universities, museums, schools and scientific societies across the world contributed through the year a great number of science fairs, hands-on exhibitions, lectures and seminars to engage the minds of school children of all ages (Fig. 4). Many of these were posted on the IYCr2014 web calendar, which, together with subsequent reports and photo galleries showing the light of excitement and enthusiasm in the eyes of the youngsters involved, provides a comprehensive record of this massive effort in early education. Fig. 4. Hands-on interaction with real crystals and with model lattices at the University of Texas open day. The International Year was also noteworthy for its many public outreach projects. As well as a large number of lectures and exhibitions, also recorded in detail on the Year calendar (www.iycr2014.org/events), much material was created and disseminated via the website. A significant proportion of this material was in languages other than English. An introductory brochure by UNESCO - Crystallography matters! - was made available in a total of 15 languages; the introductory video What Crystallography Can Do For You was distributed in 28 languages; and a freely available collection of exhibition panels is available for download in 13 different languages. Translations were mostly provided by volunteers. Other educational videos were commissioned during the Year, including animations surveying the history of the subject and providing instruction in growing crystals. The IYCr website also acts as a selected index of the most interesting and useful crystallography-related videos found on YouTube, including the stunning collection from the Royal Institution of Great Britain. A particularly engaging resource is the interactive timelines collection (www.iycr2014.org/timelines) that allows users to compare the different rates of development in many specific areas of crystallography, from the use of crystals in antiquity (3000 BC) to the present day (Fig. 5). Most entries on the timeline are linked to other useful information on the Web, including videos, information pages, and links to the primary research literature. Fig. 5. A lot was happening in the field of crystallography even before the first structure was determined by X-ray diffraction! The International Union of Crystallography has been very closely involved in the management of the International Year, and has welcomed the opportunity to devote considerable effort to public outreach and school educational activities, in which it has not previously been very heavily involved. Yet it sees these opportunities as a natural outgrowth of its existing commitment to promoting crystallography through its well established publication, standardisation, education and communication activities. As mentioned above, many of the entries in the interactive timelines on the IYCr website link to research articles in the primary literature, including the journals published directly by the IUCr. The IUCr began publishing Acta Crystallographica in 1948, and now publishes nine journal titles covering all aspects of crystallography and much structure-related science. Such scholarly journals are, of course, primarily a professional research tool; but they have the potential to be used as an educational aid. Their value in this respect increases with increasing availability, and the growing number of open-access research publications is making a larger proportion of the research literature available to everyone. Some IUCr journals are fully open-access; all offer at least some open-access content; but in all cases, the data sets associated with crystal structures are freely available, and this has allowed the journals to provide visualization tools that are freely available to everybody, and have immense educational potential. We describe these below. However, even without access to the complete contents of journals, there is much to be learned and used by educators. Simply browsing the table of contents of the IUCr journals (and reading the abstracts of published papers) illustrates both the great variety of subjects covered by crystallographic research and the extent to which research is increasingly a collaborative (and often international) endeavour. Further, all "supporting" information for any articles published in IUCr journals is freely available. This is material that is not an integral part of the peer-reviewed articles, but which is intended to support the arguments in the article, for example by giving detailed derivations of theoretical results, or by supplying additional evidence or documentation. Sometimes this material can be more educational in nature than the published work (for example, where an author goes through a detailed derivation that the reviewer has considered too long to retain in the article). In many cases, of course, supporting material will not be fully understandable if there is no access to the full article, but its importance should not be underestimated. We will discuss the special case of supplementary data sets further in a later section. One of the founding principles of the World Wide Web was that it should enhance knowledge through extensive hyperlinking of resources, and the "semantic web" is an extension of that idea, where the linking provides specific additional information. The online versions of IUCr journal articles have rich metadata to facilitate their indexing by significant keyword, and subsequent discovery or text mining. They also are annotated with links from technical terms to specialist reference works, such as the Online Dictionary of Crystallography and the IUPAC Gold Book. While such hyperlinking of vocabulary is fairly commonplace (often to articles in Wikipedia or online dictionaries), the links out of journal articles are more specific, and are designed to take non-specialist readers to the best concise definitions of technical terms. Some articles also provide "enhanced figures". These are three-dimensional visualizations of molecules or crystal structures that use a Jmol plugin (Hanson, 2010). These figures offer selected views of the molecule crafted by authors using an online toolkit (McMahon & Hanson, 2008), illustrated in Fig. 6. The toolkit also allows the authors to create alternative views accessible through buttons or checkboxes on the visualization interface. However, because Jmol is rendering dynamically the underlying structural data describing the molecular or crystal model, the reader can interact directly with the plugin, and generate different views, make measurements of molecular geometry, change the style of rendering, generate extended crystal lattices or hide different parts of the model. Authors have used these features to annotate a straightforward view of a molecule with much additional information intended to be purely illustrative or educational in nature. In allowing the reader to explore the molecular structure directly, there is also a great deal of opportunity for an inquisitive student to understand more deeply the structure under discussion. Fig. 6. The enhanced figures toolkit allows authors to create rich three-dimensional visualizations using Jmol. Readers of this Newsletter are probably already familiar with Jmol, and know that it can read many different file formats to show different aspects of chemical and crystal structure. They will therefore be aware of how many different chemical file formats there are, and of the effort required to build software applications that that can handle this great diversity. They may be less aware that most crystal structures can be described with a single format, CIF – the Crystallographic Information File. CIF was developed under the auspices of the IUCr specifically to standardise the exchange and archiving of crystallographic data. It is an extensible and flexible format, so that with relatively small effort an application like Jmol can read CIF input describing inorganic crystal lattices, organic or metal-organic molecular crystals, incommensurately modulated crystal structures, or biological macromolecules such as proteins or nucleic acids. However, CIF was not developed initially for the purpose of visualization, but for the more general purpose of allowing easy interchange of data between any computer programs involved in the pipeline of data collection, reduction, analysis and modelling. This means that the same file format is used at every step of crystal structure analysis by software. It was also adopted from the outset by IUCr journals, and is now also accepted by many other publishers of crystallographic research. For two IUCr journals, CIF is actually the medium for submitting articles (as opposed to Word or LaTeX), which means that the data tabulation part of a standard structure report paper, usually the most tedious part of a publication to compile, is already written for the author by the very programs used to determine the structure. Furthermore, since all submissions use this very standard structured format, it is possible to extract specific items of data and test independently their self-consistency and reasonableness. Such tests are carried out automatically on every crystal structure received by IUCr journals by a procedure called checkCIF (Spek, 2009), which thereby provides a technical evaluation of the submitted data that is made available to the referee during the peer review process. Furthermore, once such an article is published, the structure is made freely available on the journal website as supplementary data, again in CIF format. This allows any researcher to freely download the structural model (and, indeed, the experimental data set from which the structure was deduced) to carry out subsequent studies or analysis. The journals also provide a set of visualization and search tools that allow anyone to manipulate a set of three-dimensional views of the structure, to display the chemical bonding of organic molecules, generate predicted powder diffraction profiles, or search the journals’ own database of published structures for related compounds (Fig. 7). We reiterate the point that this set of tools is freely accessible to any user, without subscription, for every published structure since about 1991 (when the CIF format was adopted). Clearly this could be an extremely important educational resource for any school with Internet access and a standard web browser. Fig. 7. A three-dimensional visualization of the crystal structure of a potentially important therapeutic agent (Altomare et al., 2014), generated from the supporting data for an article in an IUCr journal. The right-hand pane shows the result of a search for molecules with similar chemical structure published in any other IUCr journal. These tools are freely available on the journal website. Another advantage of having every structure in a common format is that it is easy to harvest all such data sets and import the data into curated structural databases. Crystallography is fortunate in having several such databases managed by academically-based organizations such as the Cambridge Crystallographic Data Centre and the Crystallography Open Database (specialising in small-molecule and inorganic structures) and the Protein Data Bank (for biological macromolecules). The latter two are open access (though the CCDC makes available a teaching subset of its structures for educational purposes). All have a strong commitment to providing educational material that uses or describes the structures in their databases. Crystallography is an unusual subject. The importance of understanding the regular structure of solid materials has brought together scientists from many different fields – mineralogy, physics, chemistry, biology, pure mathematics. Some of these fields did not even exist when the first crystal structures were experimentally determined. Yet, in the century since those first experiments celebrated by this International Year, scientists calling themselves crystallographers, whatever their primary discipline, have felt a strong sense of community and common purpose. This has been apparent in the strength and influence of the International Union of Crystallography, and in the success of its publishing and standardisation activities. Historically, this community has also been very successful in maintaining the highest educational standards through a network of mentors and protégés, and strong support from universities. In the 21st century there are new challenges. The success of automated equipment demands less detailed understanding of the subject to conduct experiments and analyse the results; less time can be found in undergraduate teaching for the subject within increasingly crowded syllabuses; there are ever more students and fewer available teachers; and there are many new parts of the world with a thirst for knowledge but limited resources for funding practical research. This International Year has celebrated the success of modern crystallography, and has set in motion several initiatives to make it a subject known to, and understood by, a new generation and new students worldwide. As we mentioned at the outset, many of these activities will rely heavily on modern information technology. Websites will coordinate activities and provide reference catalogues of educational resources. Many of the resources will themselves be web-based – interactive applets, video tutorials, interactive quizzes, simulation software. Video learning courses are likely to proliferate, providing access to teaching to wider geographic regions. Social media will help establish and build learning communities. Remote management of experimental facilities is possible, and can allow researchers in the developing world some level of access to equipment hosted in developed nations. Databases will continue to flourish, and become more accessible to a wider public. If the International Year marks the end of the first century with a celebration, we hope that it will also get the second century off to a great start with a legacy of fresh educational initiative and energy. Altomare, A., Capparelli, E., Carrieri, A., Colabufo, N. A., Moliterni, A., Rizzi, R. & Siliqi, D. (2014). “Crystallographic study of PET radio­tracers in clinical evaluation for early diagnosis of Alzheimers.” Acta Cryst. E70:01149-o1150. Hanson, R. M. (2010). “Jmol - a paradigm shift in crystallographic visualization.” J. Appl. Cryst. 43: 1250-1260. McMahon, B. and Hanson, R. M. (2008). “A toolkit for publishing enhanced figures.” J. Appl. Cryst. 41: 811-814. Thank you for providing this information packed article on education projects of the UN mandated International Year of Crystallography. You really have been busy, with educational material ranging from crystal growing contests for school children to educational applications of semantically enhanced research journals. I have more questions than I dare ask. First, there are a number of pre-college instructors on this list, and I note the Global Crystal experiment targets 7-16 year olds and is open for the 2014-2015 academic years. I am very glad you are extending projects beyond 2014 and would like to ask what ongoing projects teachers can involve their students in (I am thinking the spring of 2015). I would also like to know if anyone on the list has participated in any of these projects, and if they could share their experiences. Implicit in this question is the need to provide teaching resources beyond 2014. Is there a place like the ChemEd X, http://confchem.ccce.divched.org/2014FallCCCENLP3 , where people can deposit and exchange education material dealing with the teaching of crystallography? This is probably a second question, but with respect to the sharing and providing of education resources, what are the plans for beyond 2014? Thanks for putting together such an information packed article. Bob, if I may address your second question first. The IYCr2014 website has been designed to act as a portal site for collecting and collating resources in association with the International Year - and beyond. We don't plan to shut down the site, nor even to put it into cold storage, just when we get to the end of 2014. It will undergo a bit of restructuring, so that its event-driven aspect is replaced by a more thematic presentation, and at that time we'll make a greater effort to lead the curious directly to the growing catalogues of videos, audio clips, reading materials, interactive games, etc. that are accumulating. If at some point in the future we feel that "IYCr2014" starts to become a historical millstone round our neck, we can also roll any or all of the contents into the main IUCr web site. They share the same content management system, and there are already examples where the identical content does appear in both sites. There are plans to develop and increase the number of targeted educational resources listed on the main IUCr website; to what extent we develop one website in preference to the other will really depend on how popular or best fitted for that role each is felt to be. which is the slightly more formal version of the page hanging out under the IUCr's own education web site. What ongoing activities are planned in spring 2015 and beyond? Regarding the more specific question of how to keep things moving, much will depend on how much momentum and enthusiasm local groups have built up over the course of the year. It's a bit early for us to get a good feel for this yet, but again part of the idea of designing the IYCr2014 website was not just to look forward to coming events but also to auto-archive them and provide reports, photos and other materials to encourage people to think "why should this only happen once"? For the more specific activity of crystal-growing competitions, great effort has been put into coordinating the activities of established competitions, and providing teaching materials, guidelines for experimental protocols, judging guidelines etc., as well as offering practical mentoring help to newcomers. This has proved terrifically successful, and has probably tripled the number of active practical competitions, e.g. with both regional and national competitions getting under way in the USA. CCDC would give you the cif files if you request them by the CCDC deposition code. It is so inconvenient to start requesting structures all the time especially if you're the end user and trying to write a paper etc. It is so frustrating that the structures in the database are not open, ready to be searched for free. I think legally CCDC doesn't have any proprietary rights to the data, they are just the keepers of the database itself. I certainly hope that RSC will soon make them go open access or even better buy them out and let knowledgeable RSC chem informatics people handle it, so crystal structures can be incorporated with INCHI, Scopus, ACS ChemWorks and everything else. Maybe we should make a petition and start collecting signatures from all small molecule chemists worldwide. Other than that I'm not sure what else to do. I certainly hate paying $1500 per license just for the search option of the CCDC. Good comments, but not yielding to quick and easy solutions. CSD (the Chemical Structural Database and associated software maintained by the CCDC) is very highly regarded for the completeness and quality of its contents. Maintaining those is a labour-intensive (hence, expensive) business, and has to be paid for somehow. Historically this was by paid subscription - it was the only way that worked when the database was established in the 1960s, and it has formed their business model ever since. I don't think the folks at CCDC are wedded to that dogmatically, but overturning an existing business model without damaging the quality of your product is, at the least, a difficult task. We face similar challenges with our journals, but we're in the happy position of being able to develop a mixed economy, with subscription, hybrid and fully open-access journals. It's more difficult to imagine how to transition to a partially open-access database. By the way, "open access" has its unintended consequences too. I learned last week of a university department in the UK where undergraduate students learned crystallography through practical solution of crystal structures, occasionally discovering new structures that they would publish in one of our journals. When that journal became fully open access, they could not afford the article processing charge (then only $100, but still not something an undergraduate class could come up with) - so they stopped the practice. Well, I suggest this isn't the place to launch into a full discussion of the rights and wrongs of all these arguments (there are many lively forums out there where the debate rages). But I offer the following suggestion as part of the educational process of appreciating just how much value is added by database curators. As you know, the RSC run ChemSpider, an open database of chemical structures which allows "crowd-sourcing" input from external contributors. OK. Get your class to select an old issue of an IUCr journal (one of the parts of Acta Cryst. published before 1991, when we started making all our structures available electronically). Find the corresponding chemical structures in ChemSpider, or add them if necessary. Get the CIFs individually from CCDC, as Christos explains you can do. Make sure that the chemical structure in the ChemSpider database is correct and consistent with the 3-dimensional crystal structure in the CIF. And, of course, verify that the InChI is correct, etc. You'll soon find that the job isn't always as easy as you might think. See how far you get in this exercise with your classes. Every structure validated and verified will have improved the quality of the ChemSpider database; it will have helped the IUCr, because you're putting more of our legacy structures into the public domain; it will have helped your students to understand the added value that comes from careful analysis and application of chemical knowledge in active database curation; and it will help forward the ideals of "citizen science" and Open Access. But it will also have cost your students - and you, as an active and careful overseer - a lot of effort. High quality is something that, somewhere along the line, someone has to pay for. We have been working closely with CCDC recently to inprove links between WebCSD, ChemSpider and our publications. Particularly crucial to this has been CCDC's expertise in appropriate InChI generation from CIFs, but more to be announced on this shortly. See also Brian's excellent points. To build on some of Brian’s points, the CCDC makes the 500 molecule teaching subset available in addition to the 750,000 structures everyone has free access to. This subset contains structures referred to in all widely used chemistry textbooks. They are selected to illustrate various aspects of chemistry and we add to this collection when asked. Finding a suitable representative structure for caffeine, from the 188 relevant structures within 750,000 entries might teach students a lot about informatics, but it’s not necessarily what people want when teaching chemistry. Brian and Michele’s article does a fantastic job of explaining why crystallography is special. The fact that every crystal structure, ever published is available to all, in high quality databases, is a wonderful community achievement. For small molecules, the structures are identified, corrected, curated and processed into the Cambridge Structural Database (CSD) – every individual structures is available to anyone at www.ccdc.cam.ac.uk. For many publishers, links from journal articles take the reader directly to the CCDC structure web pages. As Richard says, we’re working with the RSC to provide these links from ChemSpider entries too – this should be available very soon, along with an improved searching and browsing experience. For those who have a deeper interest in structural chemistry, we provide the CSD System. We do seek financial contributions for this – it’s our primary source of funding. Many nations fund CSD System provision centrally, giving access to everyone in that country. In other countries, for example the US, CSD access is usually funded at an institutional level. For Primarily Undergraduate Institutes like Jennifer’s the contribution we seek is significantly lower. The CCDC is a charity and we are committed to ensuring that no one is denied access to the CSD System due to genuine financial reasons. The contributions we receive fund the free curation and distribution services we provide and ensure that the CSD is sustainable. Brian’s post illustrates some of the challenges we face doing this. Understanding the ‘chemistry’ represented by a structure can be tough, it’s also logistically quite hard to ensure that the 60,000 or so structures we release each year are only released when they should be, with the correct details. Let’s not lose sight of where this thread started though – an excellent article from Brian and Michele. As the International Year of Crystallography comes to a close, they should be very proud of the legacy it leaves. I do have one quick CCDC question. Is the student data set accessible via a URL Get query or possibly by a Post request? I'd really like to make that data set available in the Virtual Molecular Model Kit (VMK). It appears that it is only accessible via the CCDC Java applet. Am I correct on this observation? I think having it available on an HTML5 platform would be useful to many teachers. As it stands now, the VMK is only connected to the COD data set. I’ll arrange for all the teaching set to be put on our download server so anyone can do what they like with them (it’s not an elegant solution because the set does grow, but it’s something I can do right now). I’ll add what you ask to the enhancement list for the imminent new web tools and services. That's a good solution and great news! Thanks for setting this up. An ISU colleague, Greg Ferrence, tells me that the data set is not all that large in terms of server space required, so I'm looking forward to including this CCDC educational contribution in the VMK. Colin seems to have shirked somewhat on his duties, as is the wont of Executive Directors! So I thought I would step in and let you know that we have now made the CSD teaching set available to everyone on our website. You should be able to obtain all the 733 CIF files by going to our download page at http://www.ccdc.cam.ac.uk/SupportandResources/Downloads and navigating to ‘CSD Teaching Subset CIFs’. Hopefully this will allow you to make the data set available in the Virtual Molecular Model Kit (VMK). Really good to hear that you will be putting this to good use. If we can be of any further assistance please do not hesitate to contact us. Colin, thanks for your comments. It is inevitably true that IYCr2014 is coming to an end, but there will be no closing ceremony. In fact, we are already planning the continuation of many of the activities started this year, which will became permanent or long-term initiatives of the IUCr. An "IYCr Legacy fund" is already active and a conference to formally open the "IYCr Legacy" will be likely held in Morocco in April 2015. More information will be given soon. I may have come across as being against CCDC, but I do care about the quality of the database, and I must admit that I'm happy with it. I must say that I like the steps into the right direction with integration with ChemSpider etc. I've never heard of discounts about PUIs, and I am certainly interested because I am at a PUI myself. The problem arises when only a couple of people use the CSD in an institution, and if you ask the library for a site license they want to see wide applicability and they shut your request down. I wish there was a regional license or something like that to be worked out - that would be great, but it would take a lot of coordination. Anyway... back to the paper - this is a great contribution and thank you for all your efforts. One question: If someone wishes to organize a little exhibit about crystallography at their home institution, are there any resources that could be useful, and/or demonstration ideas which are easy to do? Absolutely: http://www.iycr2014.org/resource-materials/voyage provides a set of 12 (or sometimes 39) exhibition panels in 13 different languages. See also http://www.iycr2014.org/participate for some other ideas, and http://www.iycr2014.org/about/promotional-materials for a set of freely downloadable materials, again many of them in a choice of languages. And, since we've made a point of archiving past events, go to your country listing (e.g. http://www.iycr2014.org/countries/usa) [a] to see if there's already something going on near you, and [b] to get the contact details of organisers of other events who will most likely be more than keen to share their experiences with you. On behalf of the academic librarian community... first the aside- the resource issue is a tough juggle for broad domain support, and as a service benefit we do not have the option for cost recovery. At a research institution, the IUCr journals and the CSD rank highly for support for the quality and value to characterization research; commitment to both sustainability and development of data management support by both of these institutions; and at the bottom line, the very reasonable comparative pricing. (I wonder if there might be other business models to consider for PUIs, lab-level accounts, etc.). Now to my primary question, speaking as a chemistry librarian striving to support a culture of research data management planning and metadata best practices- I'd be interested to hear from this community how CIF itself is being incorporated into chemical education curricula, class exercises, etc. Many thanks for the collective efforts of all chemistry professionals active in this unique domain. Best wishes for the remainder of IYCr2014. I personally have crystallography in my inorganic lab, where I have students synthesize the materials, crystallize them, take the crystal structures (collect data on a single-crystal diffractometer), and solve the structure down to a raugh refinement level. Then I give them the cid file and in their lab report they have to make publication-type figures, as well as crystal data and bond lengh/angle tables (from the cif file). I am also planing on offering an undergraduate physical methods course, which will go a bit deeper in crystallography (more symmetry than my Inorg. class). My colleague who teaches solid state chemistry also goes into detail about crystal structures. Since our diffractometer was an interdisciplinary effort/MRI grant, the instrument is also used in modern physics lab for crystal orientation studies. Finally, the materials engineering people talk a lot about crystallography as well, so they would also use cif files occasionally. I really enjoyed reading your article! Before this I wasn't aware that there was an international year of crystallography let alone that there are kids out there practicing building these crystal structures. I'm curious even though I am in my upper level courses of college I still haven't learned much about crystal structures, for the younger kids participating in these activities do their teachers construct these activities for them to better understand crystal structures or do they carry out the activity int order to spread the word about crystallography? indeed it is expected that the crystal growing experiment is coordinated by the teachers. Moreover, the members of the coordinating group of the competition are available to give more information about the importance of processes like crystal growth in many fields of science. Some specific materials for school teachers is being prepared during IYCr2014. For example, the Italian Crystallographic Association (AIC) has produced the book “Cristallografia: la visione a raggi X” (244 pages; language: Italian), which specifically addresses high school teachers and students. The book is available in PDF format at http://www.iycr2014.org/events/publications/teaching-booklet. The AIC has printed 800 copies which has been distributed for free to school teachers in Italy, who have demonstrated an interest in including some crystallography topics in their programmes. This book is now being translated into English and Spanish. I teach freshmen chemistry, and my question to you and the group deals with what should we be teaching at the freshmen (first year college) level [with respect to crystallography], and do you have [can suggest] any specific simulations/animations or “digital teaching and learning objects” that would enable us to do this. Now I realize you are talking about the curriculum in general, and not the freshmen chemistry classes that I teach, but you got me thinking, as I remembered doing Braggs law problems in my freshmen chemistry class. So I went and looked at three 1970’s and 80’s texts, and yes, I was right, every one of them had Bragg’s Eq. and Bragg’s law questions in the problem sets . I then looked at 3 current texts, and none of them had it. In my text, Kotz et. al., 9th ed., there is a statement: “An experimental technique, x-ray crystallography, can be used to determine the structure of a crystalline substance (fig.12.7). …” (it further states this can be used to determine “useful parameters like the radius of the atom”). Note this is not idiosyncratic to my text, but the text my students use has four sentences on X-ray crystallography (2 in the text proper, and 2 in the caption for fig. 12.7). In simple English, Bragg’s Law appears to have been removed from the freshmen curriculum, and I will confess, I do not teach it. Do others? If so, what texts do you use? This gets to the meat of my question, in this world of “automated equipment”, what should we be teaching freshmen students with respect to crystallography? And how should we go about that? Bob, I think you raised the most difficult point and clearly demonstrated that teaching of crystallography is being lost. Personally, I would first say that crystallography is not a ‘technique’ but a discipline, a branch of science. And that crystallography is moving forward from the study of ‘pure’ crystalline matter (in the sense of the periodic arrangement) to the study of more and more ‘difficult’ systems, like aperiodic crystals, nanomaterials, compounds with low degree of crystallinity, and so on. Before X-ray diffraction, crystallographers could only deal with the morphology of crystals, since that was the limit of observation, but were already interested in relating that to atomic structure and properties. XRD allowed to ‘see’ the atoms in crystals, a paramount revolution for Science, and we all know the implications. Crystallographers of today use several techniques, including electron microscopy, solid-state vibrational and absorption spectroscopies and many others, to still achieve the same aim of understanding more and more profoundly the structural properties of matter and interpreting and foreseeing the behaviour of any kind of compound. So, what would I teach to freshmen chemists? I would certainly teach translational symmetry to show how atoms can be arranged in matter, from the amorphous to the crystalline state, with all the thermodynamic and kinetic aspects related to this. I would then introduce XRD by crystals and yes, mentioning Bragg’s law, maybe starting from the double-slit diffraction experiment, to let them understand why X-rays are diffracted in such a peculiar way and how they can use this phenomenon to retrieve the structural information. In any case, I would try to deliver the message of the importance of looking in depth into matter and of relating structure to properties. My feeling is that young students take the fact that benzene is planar or DNA a double-helix for granted. No doubt about that and always known. Chemical bonds are implicit in any discussion. No input is given about how such fundamental and ‘obvious’ things are obtained. ‘Automated equipments’ have certainly produced an enormous impact in crystallography (and not only); on the other hand, they typically discourage critical thinking and constitute a serious risk for young scientists, who may lose the capability of evaluating the accuracy and goodness of data and critically analysing the results. (3)	Strategic initiatives, e.g. European Crystallography School (http://ecs1.azuleon.org/mission.php) to attract the attention of young students and compensate for the lack of school/academic courses, in order to increase the awareness about this discipline in the new generations. While not a "traditional" chem 1 course, this provides some good ways to integrate crystallography basics into the intro course. I find it most discouraging that fundamental courses on crystallography are disappearing from chemistry degree curricula. Years ago, material science used to be an integral part of our second semester freshmen chemistry, which was required of all engineering as well as science students. Now, our chemistry program is no different from what is reported in the paper, and this is a tragedy for the students, especially the engineering students. Although now retired, I have been collaborating with a colleague who teaches the Materials Engineering course which is required of all chemical engineering students, and the majority of students show a lack of spatial visualization skills, a skill that students used to develop from a study of materials science and crystallography. And according to colleagues in other engineering departments (e.g. Mechanical Engineering), they have also noticed this deficiency in spatial visualization skills. I would hope that there would be a movement to put the study of crystallography and material science back into the chemistry curriculum, especially the freshmen course. There are fundamental skills that students can only acquire in the study of this subject. Additionally, suggestions on how to interactively teach this at a first-year university/college level would be appreciated! 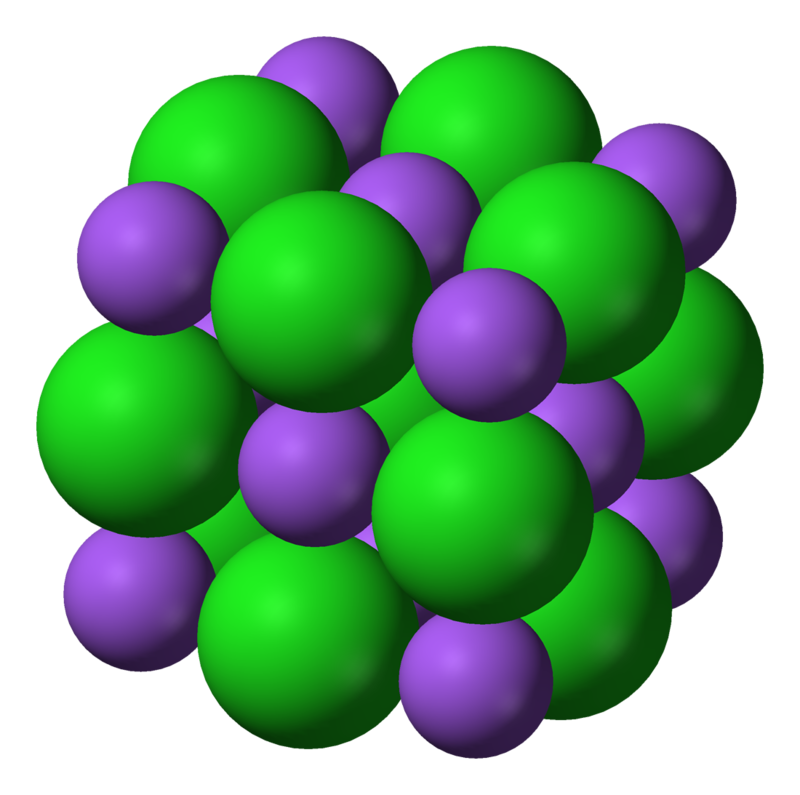 There are a few nice visualization tools for CIF files mentioned at http://www.iucr.org/resources/cif/software which can be good for getting quick hands-on interaction with structures - Mercury, from CCDC, is a particularly good tool for organic molecular structures. Oh, and if you want some good and inexpensive teaching literature, don't forget the IUCr's Teaching Pamphlets (http://www.iucr.org/education/pamphlets). A few are hopelessly out of date and many more are very old-fashioned according to today's tastes - but they still have the basics there, and don't cost anything to read online or run off copies for class use! Roy, If you just want to make simply static images, you can right click and choose export. That will create the kinds of images publishers have in their text books. Roy and others - I actually have a page that creates interactive images exactly as you describe -- and of course it uses Jmol (screenshot below). The link is http://crystals.otterbein.edu/packing. The "Show Contents of One Unit Cell" button is what generates the view shown below. The page defaults to HTML5, but there is there is the option to select Java which will generate the "truncated" view much faster. There are other resources located on the other pages under http://crystals.otterbein.edu, including notes about crystallography in the undergraduate curriculum and crystallographic point groups. With regards to offering more in the curriculum, one of the things the Crystallography community might want to consider is offering an OLCC (Intercollegiate Online (Hybrid) Course). The CCCE would be willing to assist with this. The last one was on Chemical Hygiene in 2004, http://science.widener.edu/svb/olcc_safety/, and we are currently working on one in Cheminformatics, http://olcc.ccce.divched.org/. These are a lot of work and require a community effort, but if successful could help create high-quality material that can be used(repurposed) in(to) other courses, (realize the material is created by both experts, and class-room teachers). These courses essentially discuss material with students in the same asynchronous fashion that we discuss these Newsletter articles. I also believe there is a place for some material from this community in the current Cheminformatics OLCC. Once that is completed and we can show this works, we could seek a follow-up collaborative grant to develop one in crystallography.